I got a lot of great feedback from last month’s NauticalMile column about how to catch more tarpon on fly around Pine Island and Matlacha, especially from so many transplants to this area coming from the freshwater streams and lakes up north. Since it’s finally warming up out there, and the tarpon should pop up any day now, I’ll go into some more detail about the gear you’ll need to make landing these fish on fly around here a reality. For starters, your 5-weight trout rod from Cabela’s is obviously not going to cut it. You’re going to need something with a little more backbone so start looking at 9-weights if you don’t have one already. This is the perfect all-around saltwater fly rod, especially for inshore species. A 9-weight will easily be able to handle tarpon up to the 50 pound mark, which are actually mid-size fish but the most common this time of year. If you already have a 9-weight, think about adding and 11 or 12-weight to your arsenal. These are the rods you’ll need if you want to tangle with the big girls that cruise up the Gulf beaches starting next month. And yes, I said big girls because all the triple digit tarpon are females. Male tarpon rarely exceed 70 pounds so those huge fish you’ve sees hanging dead in the old black and white photos were unfortunately breeding females. 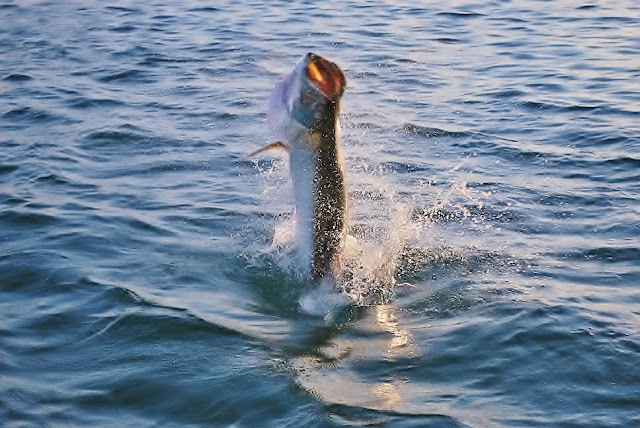 All the more reason to be glad that Florida banned the random killing of tarpon decades ago. The brand of rod you choose is not as important as it used to be. The days of Orvis, Sage, and G Loomis dominating the saltwater market are gone and now there are dozens of excellent fly rods out there, many in the $200 range, that also offer a lifetime warranty. My personal favorites are currently the Temple Fork BVK series which retail for $250. These rods would have easily cost twice that much if they were built ten years ago but advances in graphite manufacturing have brought their price way down without any sacrifices in quality. You can also pair one of these rods with a $250 solid aluminum Temple Fork BVK reel and have an outstanding tarpon fishing package for around $600, including the fly line and backing. There are dozens of rods alone that will cost you $200 more than that but won’t give you a really significant increase in performance unless you’re an advanced fly angler. If you’re just getting into the sport, spend the extra money on a few hours of casting lessons and you’ll reap the benefits when you hit the water. No matter what rod and reel you choose, it should be matched with a weight-forward floating line. This is standard for all shallow water tarpon fishing, especially here around Matlacha and Pine Island. The average depth where we find these fish is no more than five or six feet so skip the intermediate or sinking lines. If you find fish that are running a little deeper, a weighted fly tied to a fluorocarbon leader will sink down to them just fine. Finally, when it comes to flies, I’ve written entire columns on the subject and since I don’t have that much space left here just pick any pattern you like as long as it’s red and black. I’ve honestly caught 90% of my tarpon over the last ten years on red and black rabbit fur patterns, in both dark and clear water, from the Caribbean to the Panhandle. Placement of the fly obviously matters more than anything in this sport but these colors have worked best for me time and time again. Keep in mind that everything you just read are just my opinions, but are also based on almost twenty years of chasing tarpon with a fly rod. If you’re just getting into the sport don’t hesitate to throw questions at anyone who might know a little more than you do. And if you come across something that works on your own, stick with it. Fly fishing for tarpon can be the most infuriating and rewarding pastime you’ll ever experience and Pine Island is one of the best places in the world to throw yourself into it. Best of luck out there.